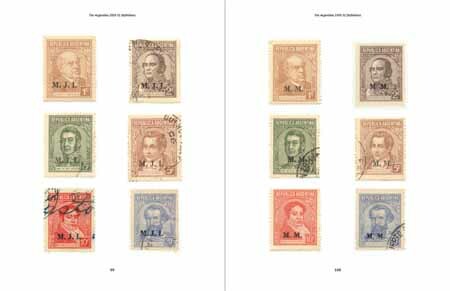 The publications I am currently producing are related to the Argentina 1935-51 definitives. My plan includes several types of studies: single issue, papers, plate varieties, ranges, postal history, etc. 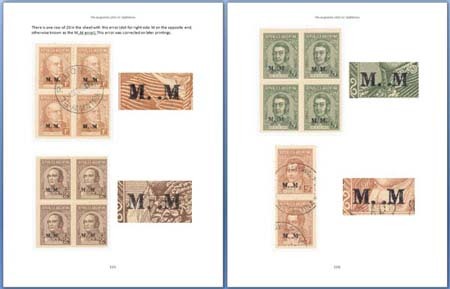 The first study is of the 1 peso stamp with map boundaries, the 1pL is at the bottom of this page. Below are links to Microsfot Word collections of NOTES from posts to forums that I am using in my long road towards a definitive book on these definitives (no pun intended). From a large selection of these stamps I show all types, many plate varieties, and postmarks (PDF, 25.5 MB). A wide range of posts about the regular issues. (PDF, 31 MB). I have used several sheets of mint Departmental and 'Servicio Oficial' stamps. (PDF, 49.6 MB). This newer version includes a complete description of the Departmental Officials and images of all of the 1E2 regular stamps known to exist (PDF, 24.5 MB). Includes a comparison of the major catalogs, and a somewhat outdated reference scheme. The 2008 reference scheme is more up-to-date. This book is a good source for images of all of the regular issues (PDF, 14.1 MB).